Week Five started with a lecture and discussion on converting traditional recipes to healthier and/or vegetarian versions. 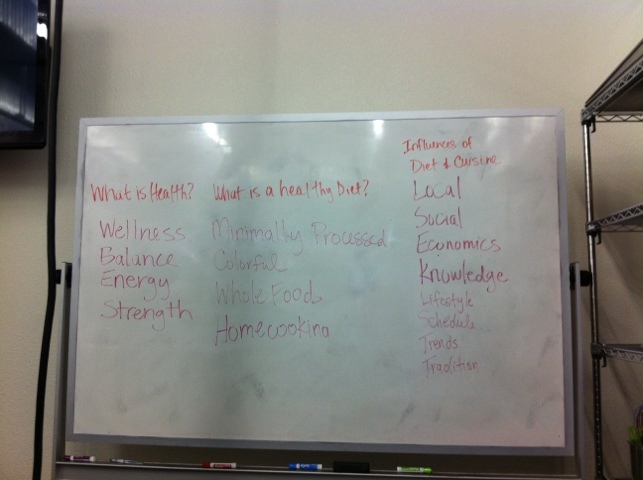 We discussed definitions of health and how food intersects with health and healing. We talked about the trends in healthier eating and then planned a week-long menu of vegetarian lunches for a hypothetical children’s camp. Making a vegetarian menu for a school would be much harder because of nutritional requirements and it would have taken all day just to do the nutritional analysis. 🙂 It was fun planning a menu and seeing how the other people on my team think – working in a group can definitely produce better results than working alone. We’ve been through Grains, Beans, Stocks, and Sauces. Time to love our vegetables! Below: My cutting board (left) has the orange zest, which I am learning to always capture in case its needed for garnish, and garlic. 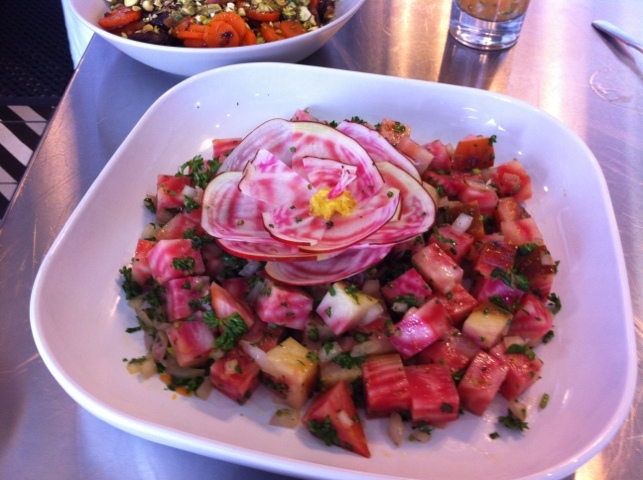 Chioggia beets are red and striated; you can see them on the cutting board to the right. 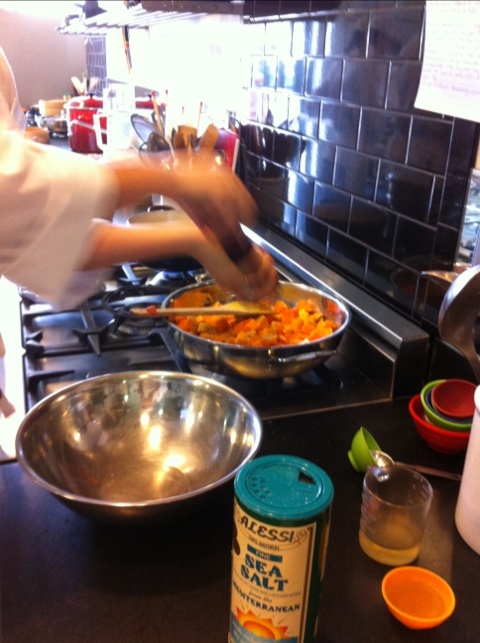 Below: Grating himalayan pink sea salt into an orange ginger dressing for our chioggia beets. Below: A really good vegetable ceviche created by a classmate. 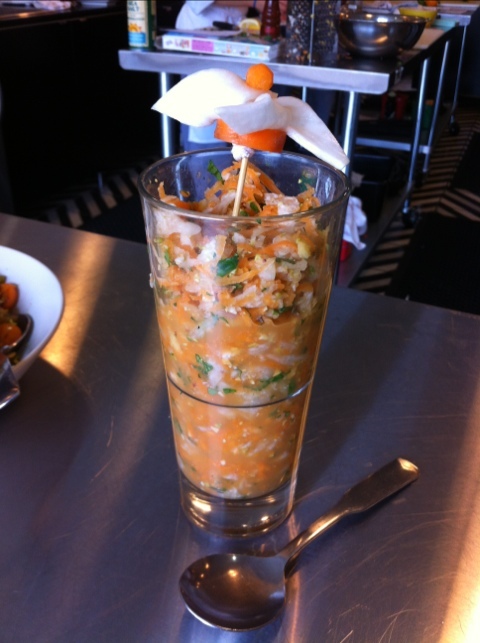 This was another example of a dish that was created outside of our assigned recipes. 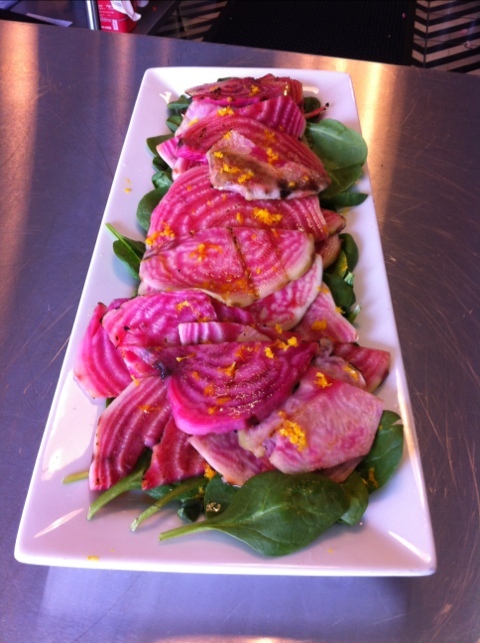 Below: My team’s orange-ginger beet salad. 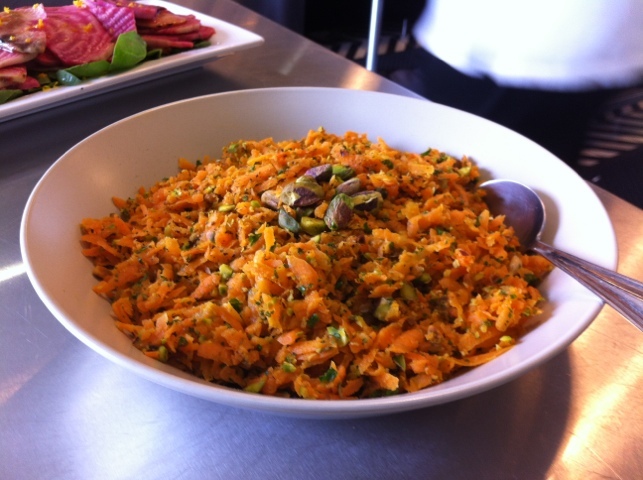 Below: A carrot salad with parsley and mint. 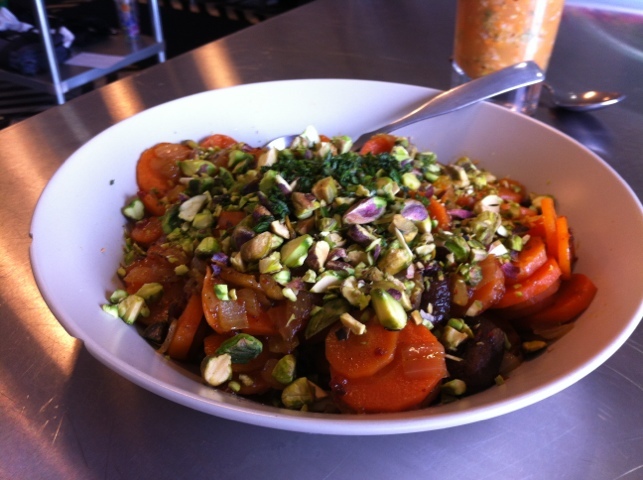 Below: A warm carrot chipotle saute with apricots and pistachios. Yum! Below: A beet salad with parsley, mint, and cilantro. I really liked this salad. Beets are really good – spread the word! Beets are crazy good for you! And fresh beets cooked well taste really good. You can dress them with a sweet or herby dressing and make them even better. Beets are loaded with fiber and vitamin C. Dr. Oz calls beets a super food because they are loaded with inflammation-stopping antioxidants, which are common in deeply-colored foods like orange potatoes and red beets. Like many root vegetables such as carrots, beets have natural sugars with are enhanced with cooking. 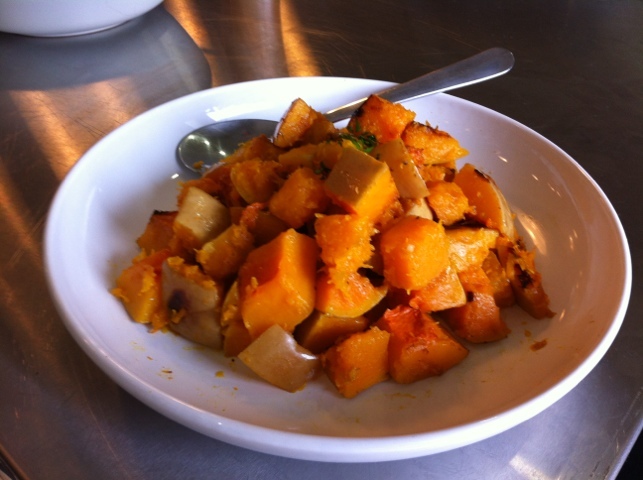 It’s not like eating candy, but as Chef Alex told us, root vegetables are often called “dirt candy” because they do have that subtle sweet flavor, which can round out your meal. Once you get off soda, fake sweeteners, and processed sugars, you will be in a better position to enjoy their health-promoting sweetness! 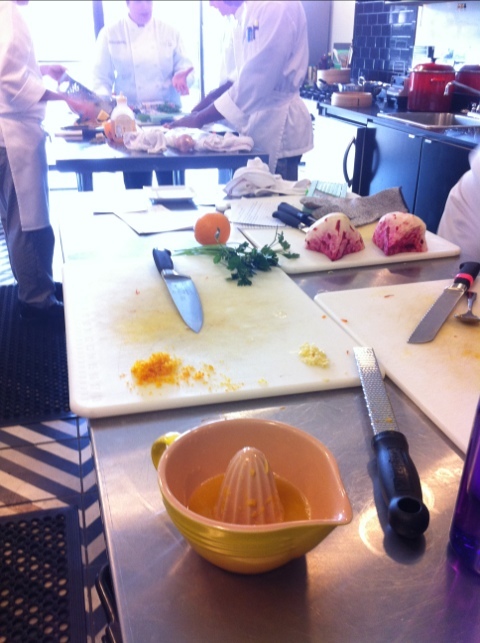 Yesterday involved more knife skills – new shapes and practicing things from yesterday. Also, we were oriented to the kitchen tools and machines stocked in the kitchen. We were shown how to sharpen our knives by Brian Henderson, who is a staff member at The Natural Epicurean and who also did an internship at Uchi, what I would consider the most highly regarded restaurant in Austin. That’s where he learned the technique of sharpening that he showed us. It was very similar to a method described not long ago in Edible Austin by local chef Todd Duplechan, but I never was sure if I was doing it right. Brian’s explanation was really helpful because I got to see it in action, and he made it seem a lot more straightforward than I thought it was. I performed the technique on my home chef’s knife and it worked very well in restoring the blade. So proud to know this new skill! We did a brunoise of green pepper – tiny 1/8 inch cubes used for garnish. We also did losenge cuts, paysanne cuts, and rondelles. We also cuts supremes of citrus and chiffonade of spinach. Much of it was used for a salad that we ate for lunch. Yum! It’s challenging making consistent cuts to specified dimensions, such as 1/2 inch cubes. Often, one side is a bit too long, or my cuts are a shade too large and my prep mates’ cuts are a shade too small and the result is inconsistent. Just imagine doing carpentry without a measuring tape, pencil, or T-square and you may get the idea. Today was the first day of school! 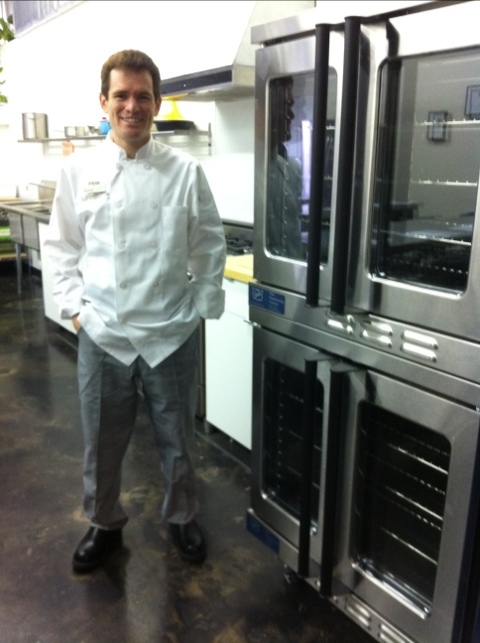 I prepared for the day by donning my school uniform: non-slip shoes, chef pants, chef coat, and chef hat. I must say, it looks pretty good, although it will take a bit of getting used to. Wearing a chef outfit is certainly a unique way to go through the day. It was a pretty long morning hearing the introductions, but vital to get to know each instructor’s background. 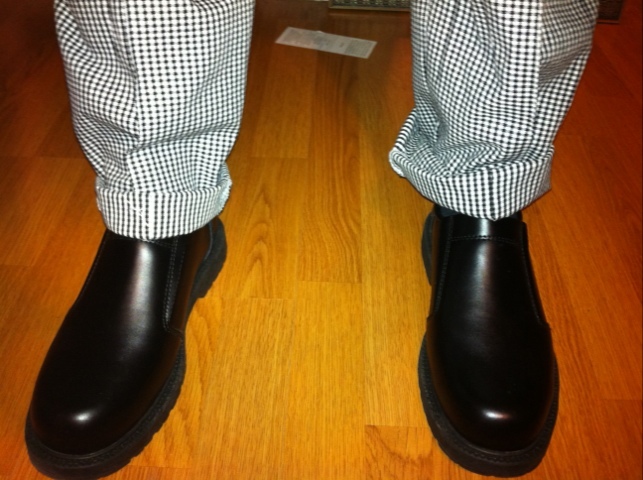 Below: My chef shoes, looking mighty fine..
Below: Me, looking sharp in my chef whites and check pants, in the lecture kitchen. Below: Students can bring their own lunches from home and use the school equipment to heat them up, however, it creates dirty dishes which I must then clean. Hmm. 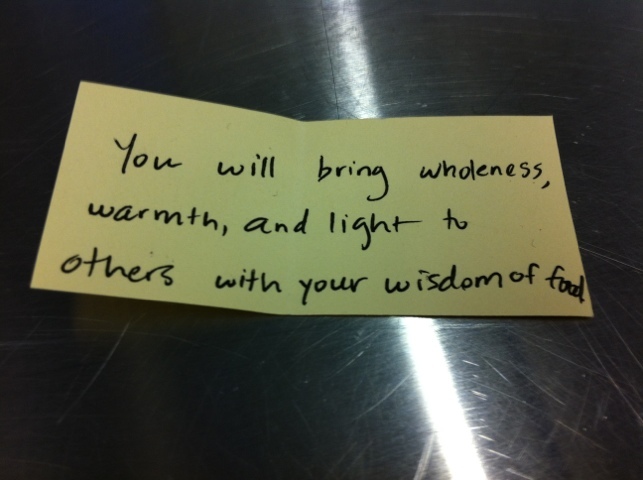 Below: We started the day by drawing fortunes written by our fellow classmates. I drew this very appropriate fortune for myself – one of my professional goals is to help bring wellness into people’s lives through information about food. The afternoon was taken up with the start of our safe food handling training. 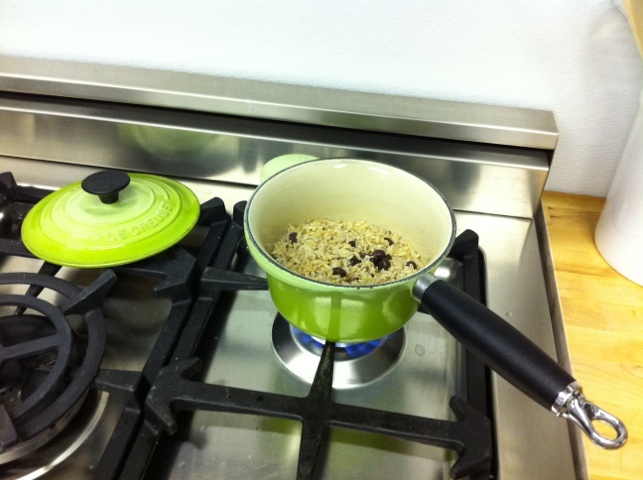 Cooking and storing food safely is of utmost importance and as such, we will spend two half days on the training. Safe food handling is both common sense and arcane – there are many facts to remember, none more important than the importance of hand washing. Correct temperatures are vital, too. We will be taking the ServSafe food handler certification test, which apparently has a very high success rate. Each week, we are expected to write a cooking journal to reflect on what we’ve learned. Also, we were assigned to listen to two podcasts to help us to think about what we might write. The topics of the two podcasts were designed to get us thinking about the direction of food culture in America, which I found very exciting. Random note – some students from the last class developed this magazine resource for incoming students. 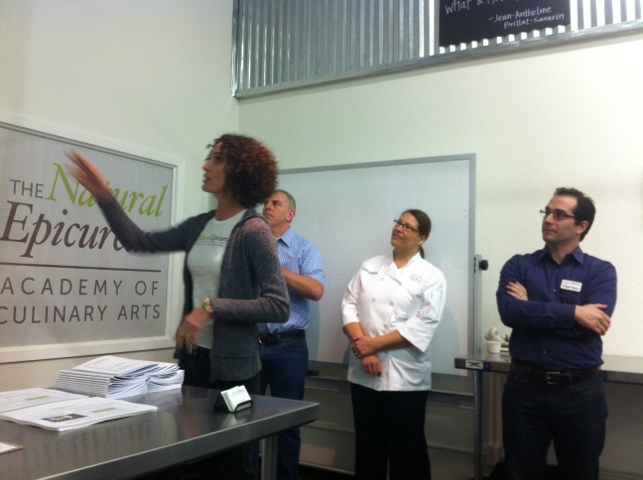 I went to The Natural Epicurean for an open house event on January 7th. This was my second such event as an incoming student (I blogged about the last open house). Even though I already know what I’m getting into, I’m the type of person who learns from being present, from interacting, and from doing. So any chance I get to visit the school and meet new people, the better. It’s all part of opening my mind to this new experience and planning to get the most from it. The open house started with a brief talk by two of the program’s students on the topic of preserving food that would otherwise have been wasted. 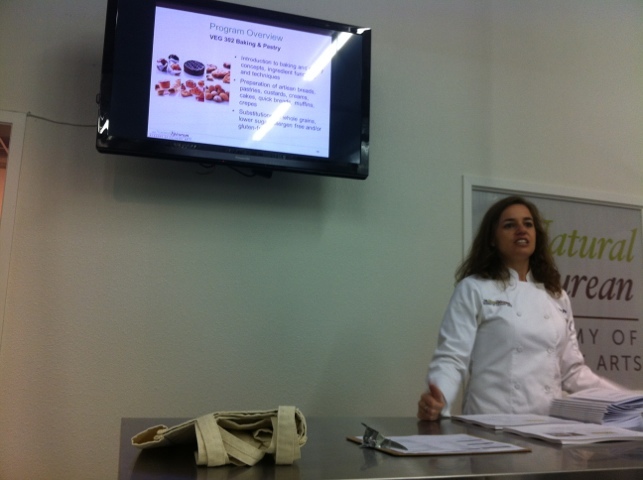 Below: A recent Natural Epicurean graduate talks about the food preservation process. She’s backed by (L to R) David McIntyre and Maya Farnsworth, the Managing Directors of the Austin and Portland locations, and Ken Rubin, the new Vice President of the school. As it turns out, there is a significant amount of food waste in our food supply Farms waste food by not harvesting all of it or not selling produce that is not ripe enough or that isn’t visually appealing enough. The same happens in grocery stores — a significant amount of food is thrown out because it doesn’t sell or the grocer decides that it isn’t sellable. Restaurants discard food that isn’t eaten and restaurant patrons toss out uneaten “doggie bags.” And finally, as consumers we waste food when we overbuy food that spoils before we can eat it all. The students shared their experience working with Green Gate Farms in preserving what’s called the “gleaning,” or the excess or undesirable food from harvest. It sounded like a great way to make the produce useful instead of throwing it out. 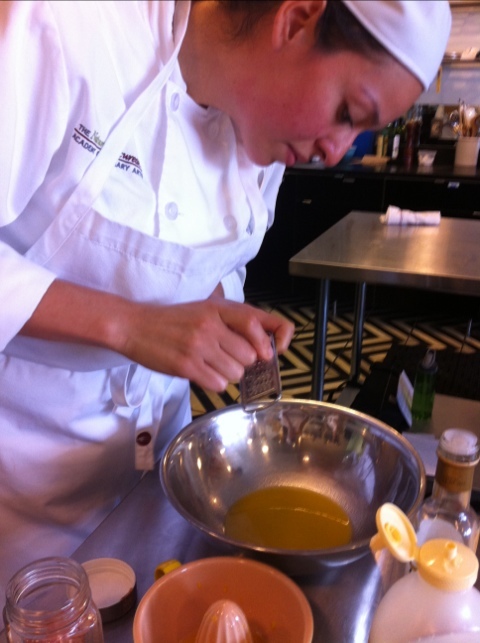 Being open to the possibilities of a new career was my big takeaway from this open house. I met Ken Rubin, the new Vice President of the school, who is a long-time culinary educator and is helping to expand the school into a national operation. He talked to me about learning by trying new things, and going after the information that I want. He also said you can never know where your life will end up in the future – you just have to stay true to yourself and keep seeking. Below: Jeanine Jacobs, an admissions rep for the school, talks about the program courses and requirements. Next, I spoke to Craig Vanis, the head chef at Veggytopia, an Austin vegan meal prep service. 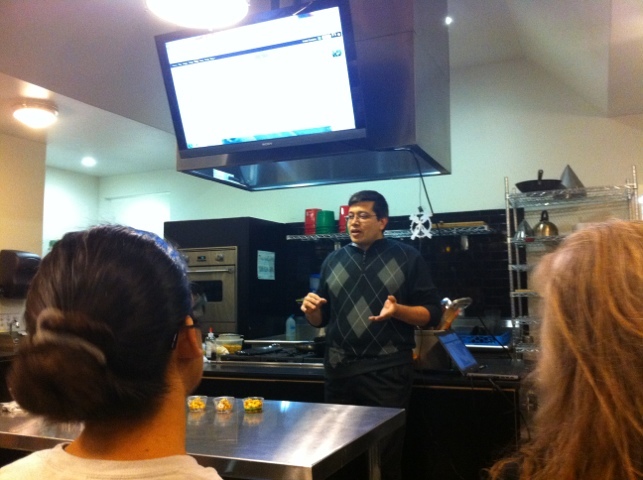 He talked about his career path and the opportunities that exist for natural foods chefs who merely seek them out. He talked about pursuing work opportunities that I’m passionate about, letting my intrinsic desire motivate me, and being pushy when I need to be. It is clear, quitting my job and sitting passively during culinary school classes is not enough. 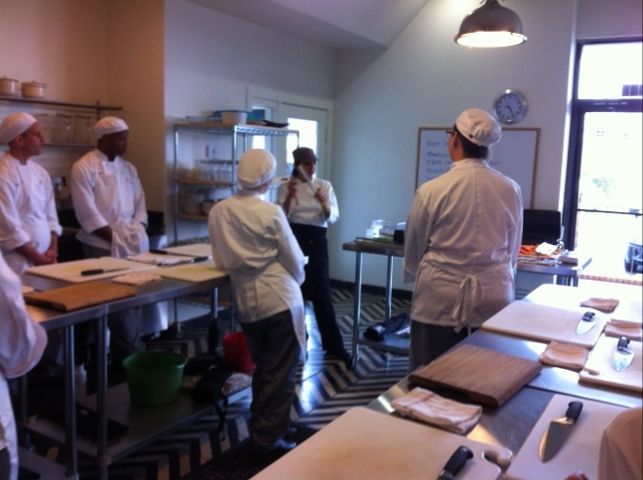 I have to actively seek information from my instructors and seek out culinary experiences. And then it becomes a lifelong learning process. It struck a chord with me that the universe will give me what I need, if I just ask and open my mind. It seems to me that a lot of success is knowing yourself and letting your natural passions show without shame. I’ve struggled a lot with showing my true self and going after what I want in all situations – breaking through that in a genuine way is going to be instrumental in my success. 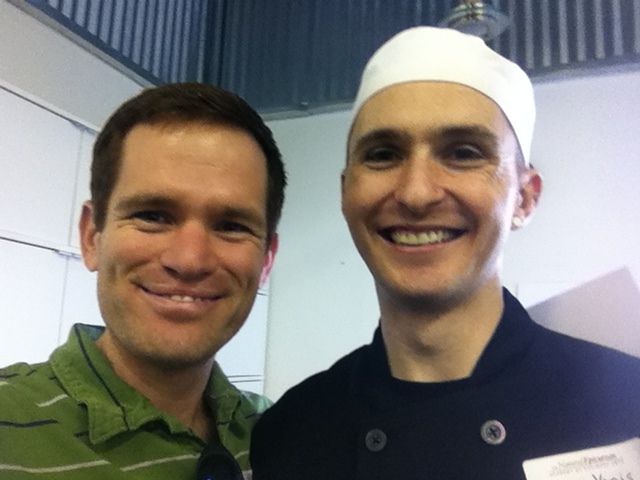 Below: Me with Craig Vanis, head chef of Veggytopia, a new vegan food preparation service in Austin. 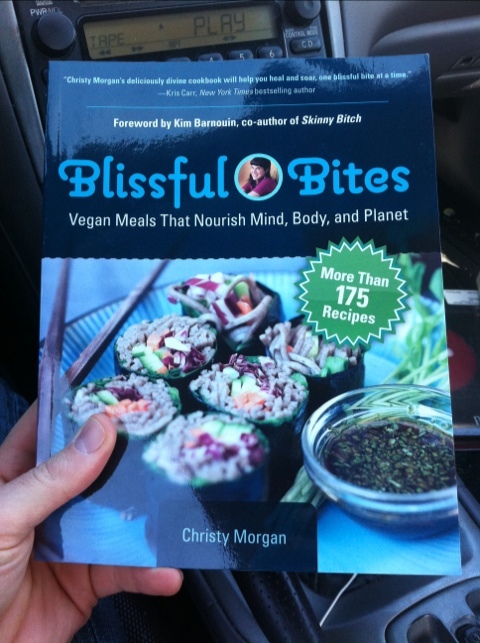 Below: I bought a book from Christy Morgan, a school graduate.